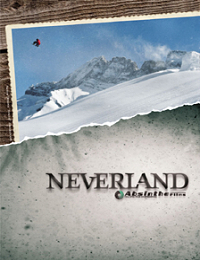 Neverland is a state of mind, a mountain pushed up from the ground by imagination. Anyone can go but most people have trouble with the simple directions: Follow your dreams. This winter Absinthe dropped down the rabbit hole to explore this elusive place and brought back some mind bending tales and a pocketful of surprises. Travis Rice, Dan Brisse, Bode Merrill, Nicolas Muller, Sylvain Bourbousson, JP Solberg, Romain deMarchi, DCP, Marc Frank Montoya, Annie Boulanger, Marie-France Roy, Jules Reymond, Wille Yli-Luoma, Cale Zima, Phil Damianakes, Wolfgang Nyvelt, Kevin Pearce, Eero Ettala, Gigi Ruf and the rest of the Lost Boys continued down the road less traveled and explored some new possibilities during a winter that saw the progression of snowboarding take some giant strides. This place has everything..... come on, I show you.